By Jennifer Burcke on March 5, 2012 Visit Jennifer's Website. by Jennifer BurckeA foot of snow fell at 1840 Farm on Thursday of last week. It was a cruel reminder that winter is not yet ready to release us from its icy grasp. It seemed incredibly harsh, given that we had enjoyed such warm sunshine only two days before. Nevertheless, by the end of the day we were completely covered in a thick blanket of snow. 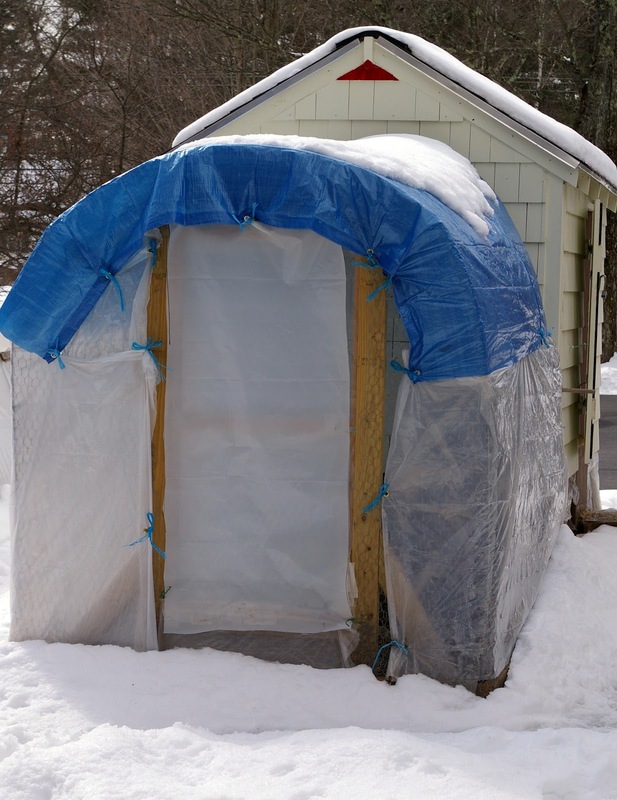 The seemingly never-ending winter is to be expected, if not embraced, by New England farmers. It simply goes with the geography. We don’t have to like it, but we have to endure it. So, we put on our snow gear, exited the barn with shovels in hand and cleared a path to the outside world while the John Deere’s snow thrower droned on beside us. None of those who dwell at 1840 Farm were happy about the most recent dose of winter’s chill and precipitation. 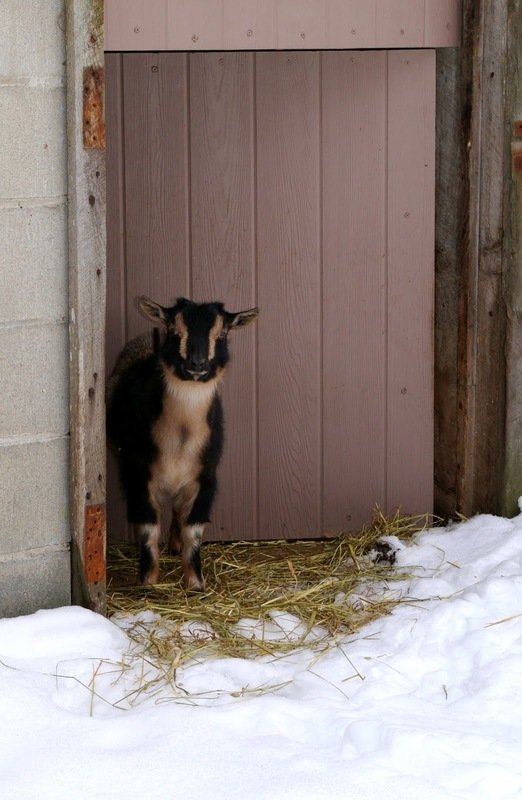 The goats chose to stay inside their barn stall and eat hay, occasionally peering out their Dutch door to verify that the snow was still falling. Each time they assessed the situation, they decided that conditions inside were much more hospitable and went back to the hay manger. The chickens had no need to make such difficult decisions. They are lucky enough to have a covered outdoor run attached to their coop. We made the decision last fall that replacing their standard run with a covered, four-season version would be worth the effort. I am happy to say that we were right. Their covered run has enabled them to spend hours outside this winter without ever having to touch the snow that covers every other inch of our property. They happily scratch around and take dust baths in the space underneath the main coop. With the opaque UV plastic and tarp attached to the run, it heats up in the sun like a greenhouse and keeps them warm all day long. They have been blissfully unaware that winter is still carrying on outside. The farmers living at 1840 Farm have not been so lucky. We’ve spent the last week tromping through snow that was high enough to eclipse our snow boots. 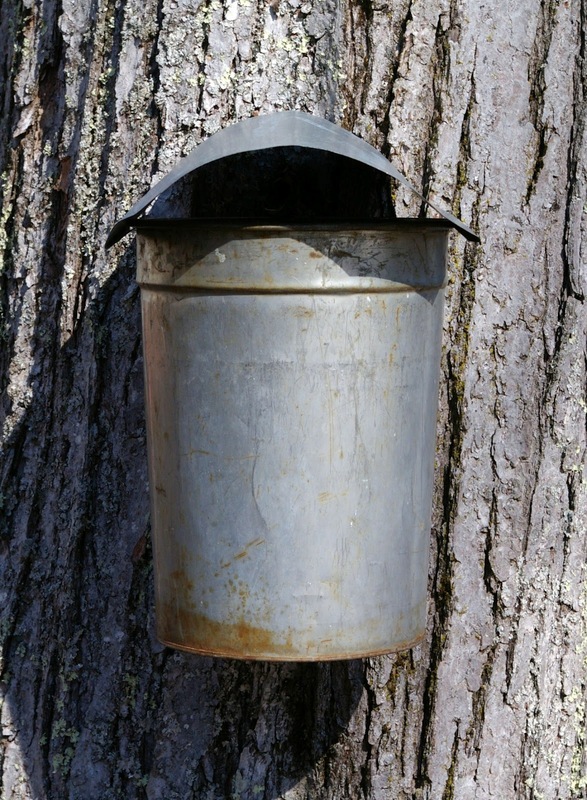 Our wellingtons were barely capable when it came time to make our way out to the maple trees and collect the sap that was dripping nonstop into the awaiting buckets. Mother Nature’s message has been delivered. We heard her loud and clear, even if we didn’t like what she was saying. We penciled winter in for the next several weeks. Doing so would mean more winter chores, more snow removal, and spending more time in the kitchen dreaming up ways to help us all cope with the cold. Those of us on sap collection duty were in need of something warm and comforting after removing our feet from freezing cold wellingtons. A bubbling pot of Smoky Black Bean Chili with Butternut Squash was called into action. In a matter of minutes, the whole farmhouse smelled of coffee, tomatoes and chiles. It is an intoxicating aroma that always brings my family to the kitchen to confirm that their nose has correctly informed them of the meal that will grace that evening’s dinner table. The heritage breed hens are never part of this discussion, but they are equally enthusiastic about my menu planning. 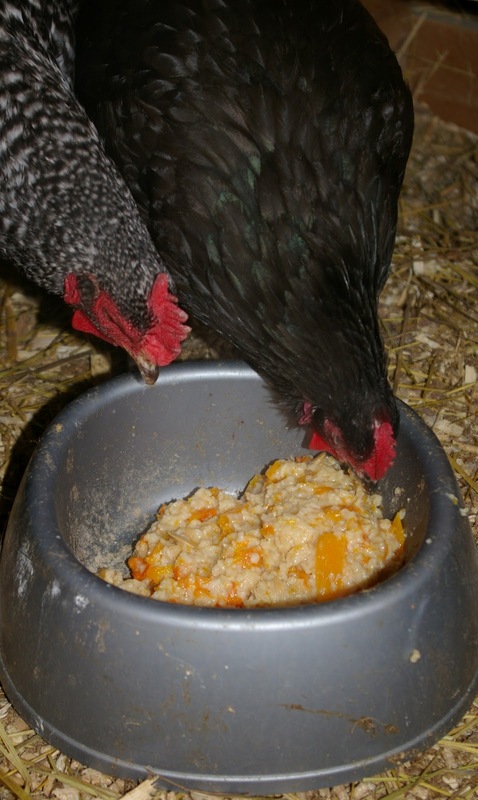 For when the farmers at 1840 Farm have Smoky Black Bean Chili with Butternut Squash on the dinner table, the hens have warm bowls of oatmeal with butternut squash for several morning meals to come. 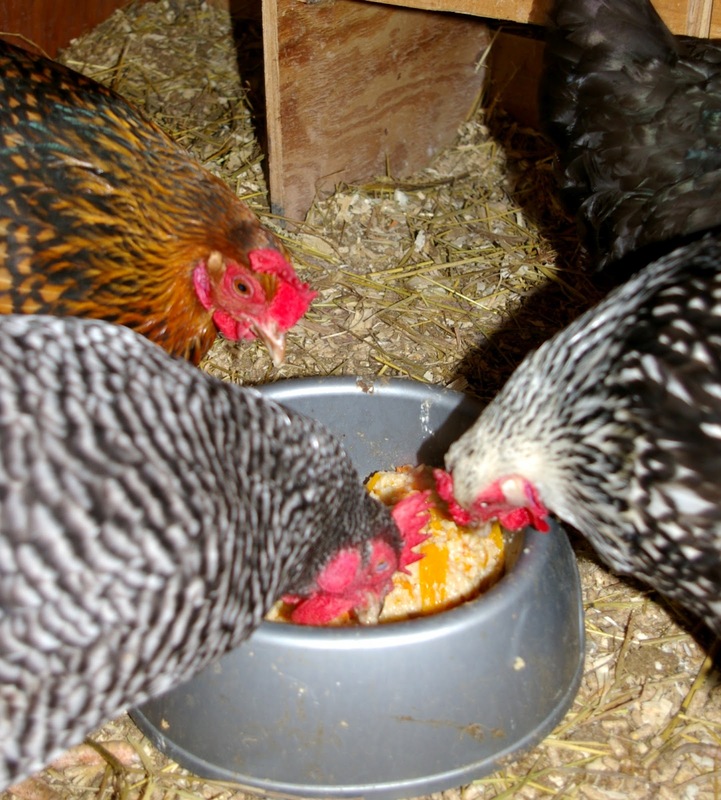 Our hens dined regularly on my recipe for “Oatmeal fit for a Queen Hen” last winter. This year, I have been making a lot of oatmeal with bananas to deliver to the coop at breakfast time. I originally selected bananas based on our dairy goat’s culinary preferences, although the chickens also love the sweetness that a banana imparts to their morning porridge. Our goats love nothing more than a banana peel as a morning treat. It seems like a fair reward in exchange for the fresh milk they provide for our family. In the case of butternut squash, I have an oatmeal addition that is based purely on the preference of the hens. As I prepare the chili, I set aside the bulb end for the chickens’ treat. After our chili is simmering away on the stove, I remove the peel and chop the flesh into small cubes. I store the cubes along with the seeds in a sealed container in the refrigerator until I am ready to prepare their breakfast. Before I had shared squash with our hens, I consulted the Internet to verify that it was safe for them to eat. I happened upon countless sites proclaiming that winter squash was a favorite treat for their hens. I found accounts from many chicken keepers who believed that the seeds from winter squash were not only a delicious treat but also held the power to help a hen fight off internal parasites. Apparently, the seeds contain a compound called curcurbitacin that has antiparasitic properties. 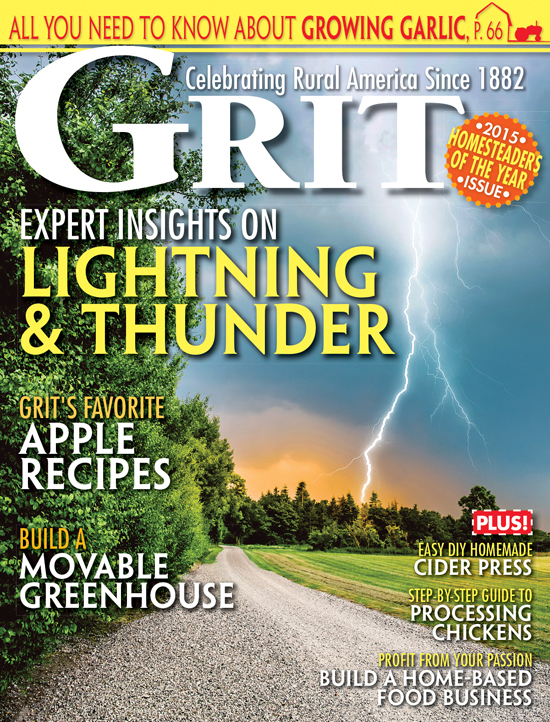 For generations, farmers chose to use pumpkin or squash seeds as a natural worming compound. I’m not sure if feeding our hens squash will help them ward off parasites, but I do know that they love eating it. They eagerly devour the seeds first and then go to work on the softened cubes of squash. They never fail to finish off the entire bowl before heading outside to enjoy the morning’s sunshine. My original recipe for the chicken’s oatmeal called for cooking the old-fashioned oats in a saucepan on the stove. That was before I began my mornings by milking a goat by hand after gathering the morning’s eggs and opening the coop so our hens could stretch their legs outside. Last winter, the hens were the only farm animals living at 1840 Farm. I had the luxury of spending a few extra minutes to prepare their breakfast. This winter, the hens have been joined by a herd of Nigerian Dwarf dairy goats and a French Angora rabbit. I no longer have the luxury of time in the morning. Instead, I have the necessity of morning farm chores to attend to. I would need to find a way to make oatmeal preparation a little easier and more importantly, a little faster. A dairy goat waits for no one. She definitely doesn’t want to be kept waiting because I’m preparing oatmeal for the hens. For this recipe, I prepare the oatmeal in the microwave as I gather my milking supplies. The squash gets cooked briefly before I add the oatmeal and finish cooking the mixture completely. Then I stir in a little yogurt or kefir and head outside to greet the hens and move quickly on to my duty at the milk stand. As I said, a dairy goat waits for no one. This recipe is a great place to use the remaining butternut squash from your favorite squash recipe. Remember to include the seeds and you’ll find that only the peel will be making its way to your compost pile. 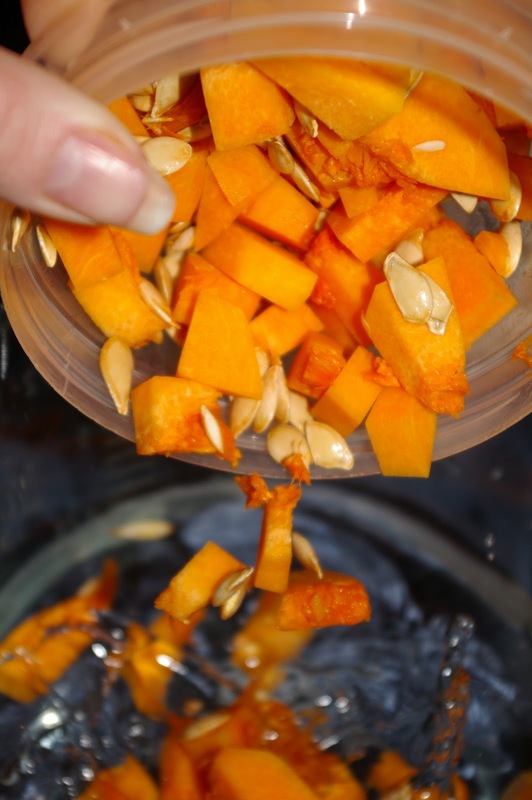 Place butternut squash and seeds in a large microwave-safe bowl with the water. Select a large bowl as the oatmeal will expand greatly as it cooks. Microwave on high for 4 minutes. 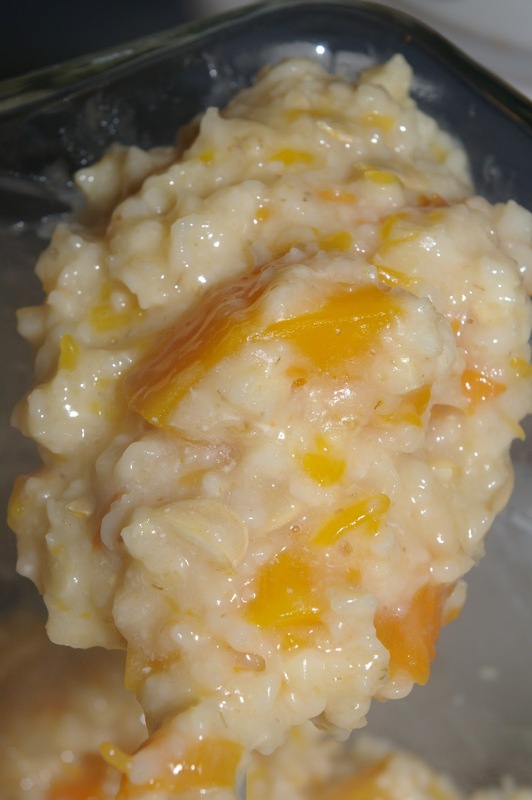 Carefully remove the bowl from the microwave and add the oats, stirring to combine. Return bowl to microwave and cook on high for an additional 5 minutes. Remove bowl from the microwave. Add yogurt or kefir and stir to combine. Allow to cool slightly and serve to the lucky residents of your coop. Excitement is on the horizon at 1840 Farm. We’re making new additions to our flock this spring. I’ll be sharing the experience with you through a recurring series of posts following the life of the day-old chicks during their first year living in the coop at 1840 Farm. During the year, I’ll be evaluating some innovative chicken keeping equipment and sharing the results with you. There will be product giveaways, special reader discounts, and of course, unending photos and videos of adorable baby chicks. To make sure that you don’t miss a single detail, follow us on Facebook to read the daily news from the coop at 1840 Farm. I hope that your hens like it as much as ours do. They love their morning oatmeal during the cold weather! I used a microwave to cook the butternut squash quickly as I got ready for my morning chores. Of course, the oatmeal could be prepared on the stovetop as my original recipe calls for. Either way, the hens will love their morning porridge! Why would you use a microwave?